New Zealand's birdlife developed extraordinary diversity as a consequence of evolving on isolated islands without mammalian predators. For many years, habitat destruction brought on by humans posed a distinct threat to the wide variety of birdlife, but thanks to recent conservation efforts, many of the country's species of birds are now protected in parks and island sanctuaries. 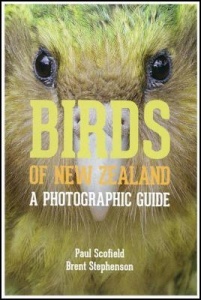 Illustrated with nearly a thousand new photographs from one of New Zealand's top nature photographers and drawing on the latest information from birders and biologists, Birds of New Zealand offers a definitive introduction to the identification and behaviour of the country's extraordinary avian life. The book includes expert and up-to-date information on the 345 bird species found in New Zealand, including species ranging from albatrosses and shearwaters to kiwi and kaka. It will be a valuable addition to the existing literature on birding. 500 pages; 1,000 colour illustrations. Paul Scofield is Curator of Vertebrate Zoology at Canterbury Museum in Christchurch, New Zealand. Brent Stephenson operates his own photography business and works as an ornithologist and birding guide.